Non-pharmacological interventions have been applied to manage Behavioural and Psychological Symptoms of Dementia (BPSD). However, these interventions have not been assessed from an ergonomics perspective. 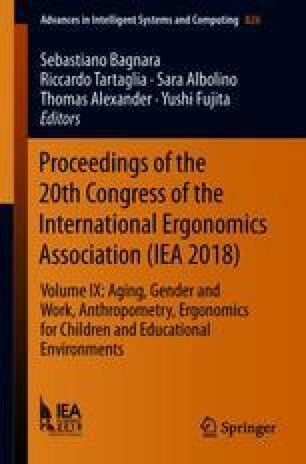 Ergonomics has investigated the age-related capability changes in terms of sensory, cognition and movement aspects. This study aims to review the existing non-pharmacological interventions for BPSD targeting nursing home residents and generate design recommendations based on the domain of ergonomics in ageing. The electronic databases MEDLINE, EMBASE, PsycINFO were searched for studies which applied non-pharmacological interventions for treating BPSD in nursing home residents. A total of 67 studies met the inclusion criteria; from which 16 types of interventions were identified. Within these intervention types, the main capabilities required from the interventions for People with Dementia (PwD) were identified. The interventions were then categorized into sensory-, cognition-, and movement-oriented according to the main capabilities. Design recommendations were then generated for the interventions with knowledge from the domain of ergonomics in ageing.